Cassowaries’ powerful feet have sturdy claws that can be deadly weapons. 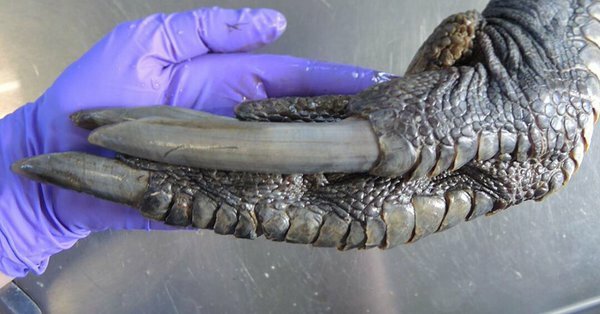 A photo showing an enormous, scaly foot that dwarfed the photographer’s hand recently captivated Twitter. With muscular digits tipped by powerful claws, the appendage resembles a dinosaur’s foot — and that’s exactly what it is. The foot’s owner was an imposing (though deceased) flightless bird called a southern cassowary (Casuarius casuarius johnsonii). Cassowaries, along with all other modern birds, are living dinosaurs, descendants of the only dinosaur lineage to survive the Cretaceous mass extinction about 66 million years ago. Paleontologist Sarah Davis, a doctoral candidate at the University of Texas at Austin, tweeted the image on Jan. 15 to highlight the similarities between birds and their extinct dinosaur cousins, adding hashtags that included #birdsaredinosaurs.